Lot 378 of the Alexandre Weill Tract. Title now vested in me. No. Full name of wife or husband. (When application made by wife give husband's name, occupation and age here.) How much per month do you wish to pay on this loan? $...... No. Shares....... Is your financial condition such that you can make the required monthly pay ments? Yes. From what source does Applicant expect to receive money to meet monthly payments of dues? From rentals. Is any one other than Applicant in possession of any part of the premises? Yes. If so, give name, and state by what right such person is in possession. James Boyd; under written lease. FOR CITY OR TOWN PROPERTY. Improvements, now on, $3500. Total, $6500. Is any building in process of erection? No. Is any contracted for? No. What is the contract price? $....... What amount of insurance will you carry? $3000. House now on (or to go on)......stories......rooms. Number of rooms or other improvements to be added to present house? None. Size of house? 40x65. How finished inside? Pine. Any barn? No. Size of barn....... For what purpose is the property used? Apartments. What is the water supply? City water. 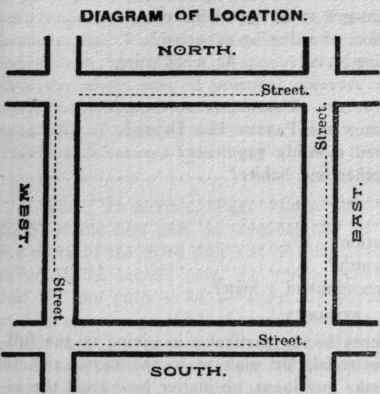 Mark the lot on this plat in reference to the direction in which it fronts, and the names of the streets which surround the block. I hereby agree to assign to this Association one or more shares of its capital stock for every One Hundred Dollars I borrow, and I will furnish at my own expense a complete and acceptable Abstract, or Certificate of Title, to the property, and will pay all necessary expenses connected with the loan (including the charges of counsel for examining title if an abstract is furnished), and as long as I have the loan I will carry fire insurance of such an amount and in such companies as is required by the association, with the clause attached, "Loss if any payable to them as their interest may appear," and if by reason of any defect in the title, or change of circumstances, this loan is not taken by me after this application is accepted, I will pay the Association the amount of the Appraisal Fee, and any money expended on my account. I Further Declare that the Answers Written in This Application Are True. Los Angeles, Cal. Dated, June 3d, 1903. To Agents or Applicants : The Appraisal Fee should be paid in advance and handed with this application to your Appraisal Committee.